Short Review: A considerable improvement over previous Datsusara gi trousers I've tried, the Real Dope Pants are easily among the most comfortable gi trousers I've ever worn (and I've worn a lot in the last decade). The green and black colour scheme is striking, although the gentle humour of the embroidery may still be too much for some. I also found the drawstring was too long for me, but that is an issue with most drawstrings, easily resolved by cutting and singeing the ends. These trousers are not cheap at $75 (available here, from the Datsusara website), but if you value comfort, it's money well spent. Full Review: Datsusara have remained the most prominent name in the hemp gi market, a profile that has risen since their sponsorship of the Eddie Bravo Invitational. On that event, you may have seen the referees wearing some stylish trousers with a green drawstring. Those are the 'Real Dope Pants', a marked departure from Datsusara's previous HCG ('hemp combat gi') model, at least in terms of the older editions I've tested over the years (the HCG-02 and HCG-03: Datsusara is currently up to the HCG-06). Those older gis used a weave that was comfortable and breathable, if comparatively heavy. The same weave was used in the Flow Kimonos hemp offering (which I reviewed here). They've proven to be excellent training gis, but are too bulky for travel. This is in contrast to another hemp gi I own, currently my favourite of any gi: The Green Gi. I own two jackets and one pair of The Green Gi trousers. The weave is tighter than either the HCG-02/03 or the Flow Hemp, which may explain why it feels lighter and is easier to pack. The Green Gi gets my vote for top spot because it's ridiculously comfortable. 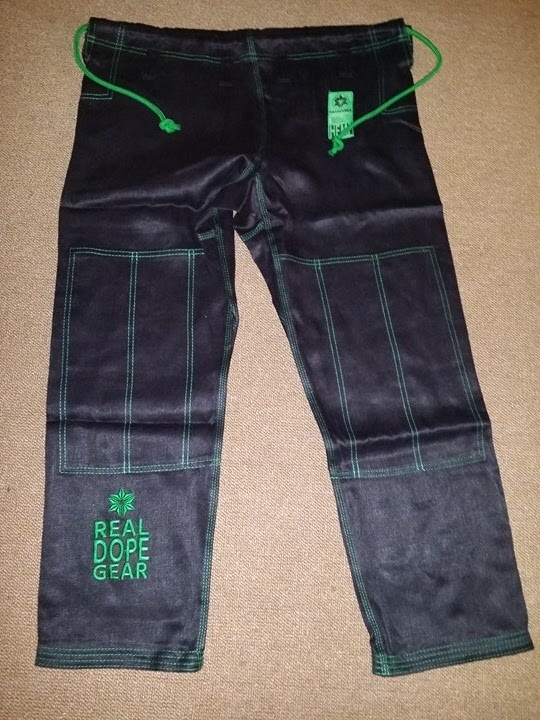 After I first put them on, the Real Dope Pants immediately reminded me of The Green Gi: they are just as comfortable. If the HCG-06 is made out of the same weave, then that is going to make for a very tempting purchase the next time I'm in the US. The striking green and black colour scheme of the Datsusara trousers elicited plenty of comments when I first walked in wearing them, but as regular readers will know, if I own something black it doesn't stay that way for long: I like colour. I bleached and then dyed the trousers, as I wanted something I could match with my second The Green Gi jacket, which I dyed dark green a while back. Before I attacked it with various chemicals, the black was attractively set off by the green stitching and embroidery, along with a green bungee cord drawstring. I found that drawstring overly long for my taste, though this is a problem with every bungee cord style drawstring I've tried so far. It's easily rectified, as you can simply cut the superfluous material, then singe the ends with a candle to prevent fraying. It comes undone more easily than my favourite drawstrings (which are from Fenom Kimonos), so there is perhaps slightly less friction in the finish compared to the Fenom. These [the Datsusara] are the most comfortable. These [The Green Gi] are just as comfortable, thicker, so for the winter they'd be perfect. However, I can feel the stitches, because they are right across my thighs. But with this [the Datsusara], it's like wearing nothing. As soon as she rolled in them, she was asking me where she could buy a pair. Personally, I prefer The Green Gi, but it's close. The reason is that while I find them equally comfortable, I prefer the cut on The Green Gi and they have thicker reinforcement panels by the knees. I haven't had any issues with the stitching on the trousers, though I did have the seam tape by the sleeve cuffs removed due to itchiness (I think from the seam tape edge, rather than the stitching itself). I also prefer the plain design of The Green Gi. Normally Datsusara are notably plainer than most other companies, so the shift to increased embroidery and patches on the Real Dope Pants was a departure. I don't mind the kanji, it was the 'Real Dope Gear' embroidery I found off-putting. I live in Bristol, where you will often smell pot wafting down the street. My attitude is that as long as they aren't smoking it on my mats, I don't mind: what you do at home is your business. However, even the gently pro-pot implication of the 'Real Dope' pun wasn't a message I felt comfortable displaying on my gi, especially as an instructor. I therefore covered it with a patch, though the embroidery would also be fairly easily to remove, judging by my quick test unpicking a few of the threads. Before washing, the A1 trousers I got were 93cm long. After several months of regular washing at 30 degree Celsius, they have shrunk to 90cm. If you stick to 30 degrees, then that would indicate you can be relatively confident that the sizes on the website are not going to shift dramatically. It will be interesting to see what the durability is like on the Real Dope Pants, so I'll update this review in a couple of years. 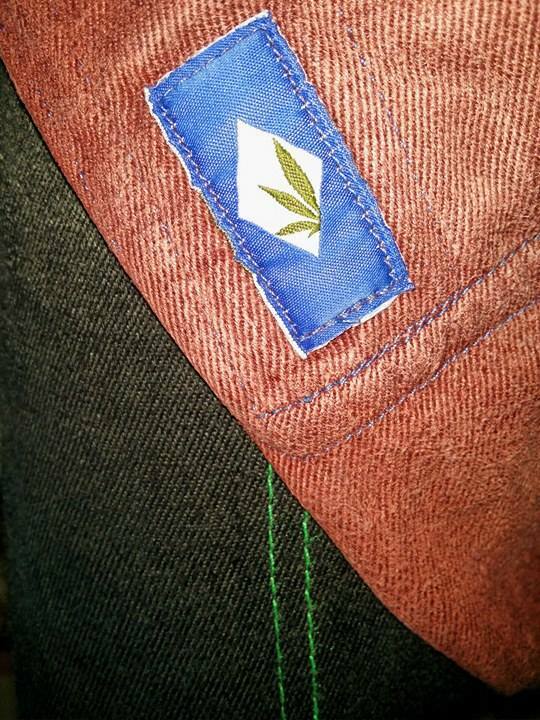 There are many alleged benefits to hemp (see my old HCG review for more discussion of that), but as ever the only one I can currently confirm is that hemp clothing has a considerably greater level of comfort compared to cotton.